This is a scorecard and yardage book holder made from synthetic leather by Sunfish. 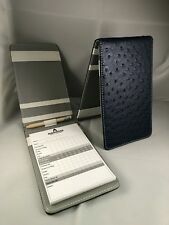 Scorecard and Yardage Book Holder. It has five elastic bands to hold your scorecard, yardage book, hole location sheet, and even your pencil. Motocaddy Scorecard Holder. Brand new in box with instructions. Idéal pour offrir ! Ce mini sac de golf sert de porte crayon et d'horloge. Golf Bag novelty Pen Set. Nous préférons vous prévenir et être honnêtes. Fonctionnalité : des boucles élastiques durables sont faites pour s’adapter à presque tous les accessoires dont vous avez besoin lors d’un match. durable carabiner allows you to easily attach the holder to your golf bag. ☀ facile à utiliser : la main tally 4 chiffres compteur de Lap compte de 0 à 9999 et lorsque vous appuyez sur le bouton une fois qu'il compte pour une. ♥ ne nécessite pas de piles, bouton de réinitialisation facile et Giant bague de doigt pour plus de confort aux mains. This is a scorecard and yardage book holder made from leather by Sunfish. 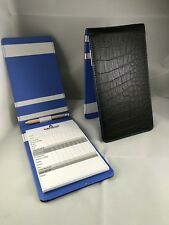 Scorecard and Yardage Book Holder. 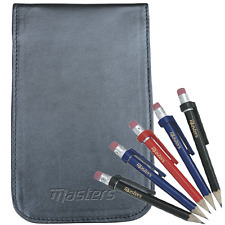 It has five elastic bands to hold your scorecard, yardage book, hole location sheet, and even your pencil. Harrister’s golf scorecard holder is handmade from 100% veg tanned top grained leather and is unlike any other scorecard holder available. The Harrister Golf Original Scorecard Holder is handmade from 100% veg tan, top grained leather. Pour désactiver le décompte Appuyez sur le bouton ON / OFF pendant 5 secondes lorsque l'affichage du compteur est à "0". Faible consommation d'énergie, durée de vie typique de la batterie> 250 heures, batterie incluse. This and all my scorecard holders are proudly made entirely in the USA from real leather. I don't use imitation or synthetic leathers. If this is important to you you are at the right place. These scorecard holders are designed to hold your scorecard securely and easily slip into your back pocket during your round. Idéal pour offrir ! Ce mini sac de golf sert de porte crayon et d'horloge. Golf Bag novelty Pen Set. Veuillez conserver le reçu. Nous utilisons une sélection de services d'expédition locaux. Thin profile fits in yardage book covers perfectly. Green Image Area less than 5/8 in. 2019 USGA Conforming. Creating your own tour style yardage book is fun and it will lower your scores! You can easily create incredibly accurate yardage books right from your desk. This and all my scorecard holders are proudly made entirely in the USA from real leather. My holders are made with a thicker 7 to 9 oz high quality leather. The corner keepers are held in place with leather weld (glue) and not sewn. 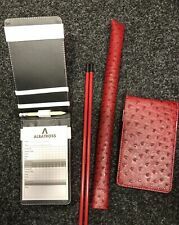 Convenient to put golf score card, pencil, balls and tees onto score card holder. 1x golf score card holder. Color: black transparent cover. Great for record scores. 235x125mm/9”x5” (Length x Width). 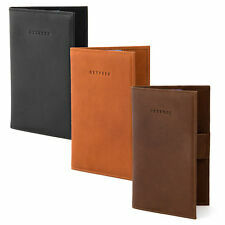 These holders are one thick piece of leather with the pockets, elastic bands and pencil holder sewn inside. There are no cardboard inserts in these holder to keep their shape so they are bendable with ultimate comfort. Compatible Avec Masters Golf Trolleys. Nous préférons vous prévenir et être honnêtes. 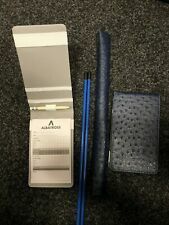 Convenient to put golf score card, pencil, balls and tees onto score card holder. 1x golf score card holder. Le 13-avr. -19 à 09:56:13 Paris, le vendeur a ajouté les informations suivantes Great for record scores. Located on the front lower right is a magnetic circle where your ball marker can be held in place. 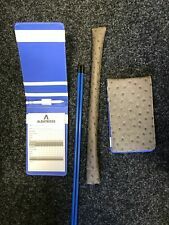 Convenient to put golf score card, pencil, balls and tees onto score card holder. 1x golf score card holder. Great for record scores. 235x125mm/9”x5” (Length x Width). 1 Weatherproof Scorecard and Stats Notebook. Weatherproof Scorecard and Stats book made with "Rite in the Rain" paper. 4 Blank Yardage Books 2019 USGA Conforming. Thin profile fits in yardage book covers perfectly. Pete's Team is always standing by to help you! 1x - Accessory Organizer (Felt Liner). Organizer Kit includes the following Looking for that perfect solution to all your shuffling on the course looking for your things when you need them. Elastic strip on outside of the pouch that can hold up to 3 golf tees or anything that sort of shape. 1 x Golf Ball Bag. Easy to carry with the strong clip, can be attached to your golf bag or belt. This is a scorecard and yardage book holder made from 100% leather by Sunfish. 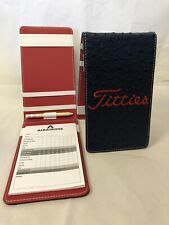 Scorecard and Yardage Book Holder. 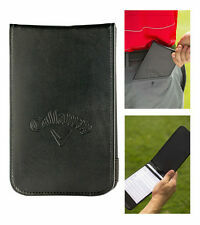 It has five elastic bands to hold your scorecard, yardage book, hole location sheet, and even your pencil. Sunfish Golf Scorecard Yardage Book Holder Cover-BUSHWOOD CC-Caddyshack! Scorecard holder. Included in this bundle is Score card Holder Head Cover. Sunfish black Leather Golf Scorecard and Yardage Book Holder - Sugar Skull !